New Birmingham manager Lee Clark says the Blues are a "Premier League club in waiting" and has backed himself to build on the work done by predecessor Chris Hughton. Former Huddersfield boss Clark, 39, was confirmed as the new St Andrew&apos;s boss last night, almost three weeks after Hughton departed the npower Championship outfit to take charge of Norwich. Hughton battled City&apos;s well-documented cash-flow problems and put together a new-look side following relegation from the top flight, shining in the Europa League and FA Cup before finishing fourth in the Championship and losing out in the play-off semi-finals to Blackpool. Blues also remain under a transfer embargo, which was placed on the club by the Football League at the start of March having not filed their 2010/11 accounts on time. 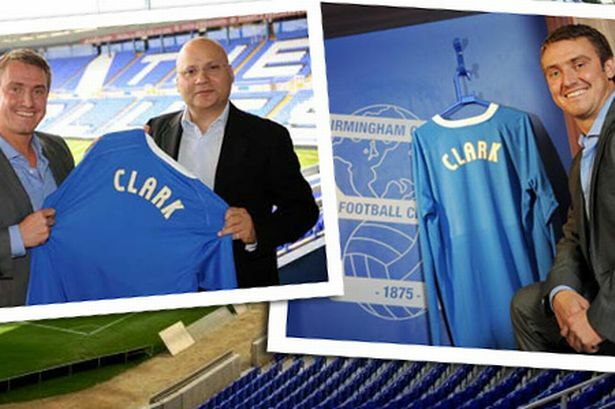 But Clark is undaunted by the task in front of him, and told club website bcfc.com: "This is a big, big club as I know from whenever I&apos;ve been fortunate enough to be here as a player or as a member of the opposition coaching staff. "The passion and drive of the fans is superb and when you walk around and see the facilities and the stadium then you know that this is a Premier League club in waiting. "It will be a big test but that&apos;s just the expectation of myself and my staff. "Looking at the basis of the squad, there&apos;s a great mixture of experienced players who are still hungry to be successful and young players who are still learning the game but are exciting. "One thing that I&apos;ll be bringing with me is the work ethic, the desire, the passion that I have for the game and I will strive every day to make the club better." Clark&apos;s assistant manager at Birmingham will be Terry McDermott - also his number two at Huddersfield - while the new man also hopes to bring in Derek Fazackerley as first-team coach. Clark, who will be officially unveiled at a press conference at lunchtime today, was surprisingly axed by Huddersfield in February after just over three years in charge, with Town fourth in League One at the time. The former Newcastle, Sunderland and Fulham midfielder guided the Terriers to the League One play-off semi-finals in 2010 before going one step further a year later, losing out 3-0 to Peterborough in the final. Much of Town&apos;s relative success under Clark was built around a 43-game unbeaten run in regular season league matches stretching from December 2010 to November 2011 - a Football League record. And Clark is confident he can bring his experience to the fore as he seeks to win over the St Andrew&apos;s faithful. "Without a doubt I will aim to entertain the Blues fans," he said. "My record speaks for itself. In my two full seasons at Huddersfield we were in third position in the league for the highest goalscorers, the next season we were fourth only behind the clubs who got automatic promotion and when I left in February we&apos;d scored more than anybody else in the league. "Of course, I like my teams to be solid but I like them to entertain and score lots of goals. I want to have the fans on the edge of their seats and be productive. "It&apos;s not often you come into a football club where things have gone well but I&apos;m taking that job now and my aim is to enhance things."